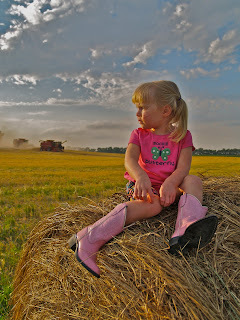 Miss E got off the combine after riding with her Grandpa Fred but wasn’t ready to go home to take a bath. So we settled in on the edge of the field to watch the barley harvest on top of a row of hay bales. 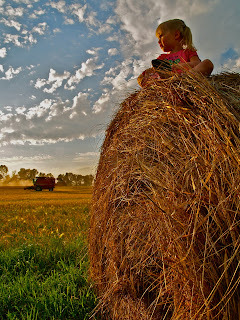 I ended up taking more than twenty of my favorite photos I have ever taken during our time on the bales. It was one of those moments I wanted to box up and save forever. 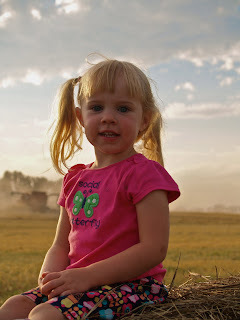 She told me all about what Grandpa Fred was doing in the field and how she liked helping him “fill the sand (barley) in the trucks”. We watched Great-Grandpa Sonny roll by in his combine, Great Uncle Jim with big brother Hunter riding along in their combine and Uncles Robbie and Joe both drive in the big tractors pulling the grain carts. We watched the combines dump “the sand” on the go into the grain carts. Then the grain carts dumped into the trucks which were hauled away to the grain bins. We might live 90 miles from Wal-Mart, Starbuck’s and McDonald’s but this is a great reminder why we do, four generations of family in one farm field. 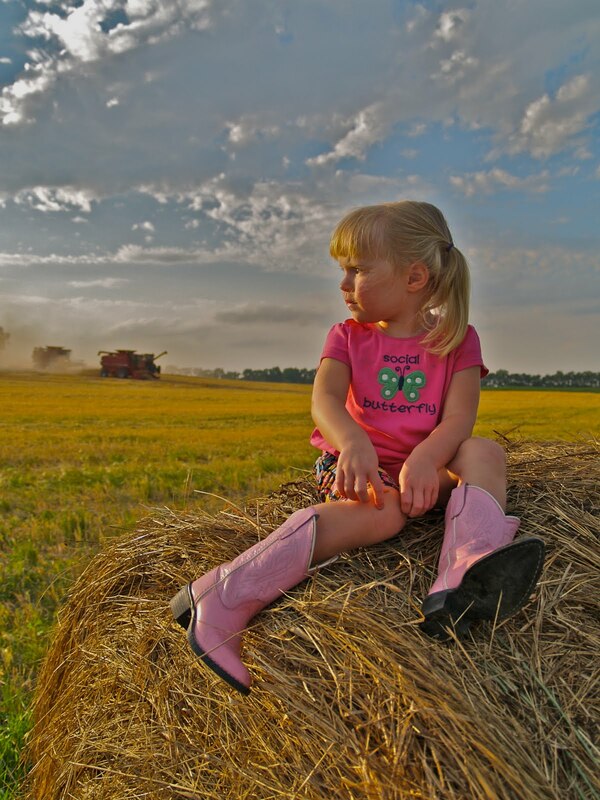 It is a life experience that you cannot get in the suburbs of New Jersey or in downtown Chicago but on the prairies of North Dakota our kids know this everyday life as their own. For that I am grateful for our farming family and the livelihood that is carried on across four generations in North Dakota.